Download your Free 2015 Calendar Templates here. 1.Take an 11 x 11inch piece of grey board or thick cardboard and cover with a sheet of 12x12 Parisian Chic paper, wrap the paper around the back of the board to cover the sides. 2.Cover the back of the board using another piece of decorative paper cut to 10 ¾ x 10 ¾ inches. 3.Cut a piece of A4 white card stock to 21 x 17cm. Score at 2, 10, 12 and 20cms on the long edge. Turn and score at 2cm on the right hand side, cut along the score lines to the 2cm lines. The 20cm score line can be cut off. Stick the box together, cover with patterned paper and set aside. 4.Download and print the calendar, cut out and stick together in order. We used the Fiskars perforating rotary tool to make it easier to rip the sheets out. 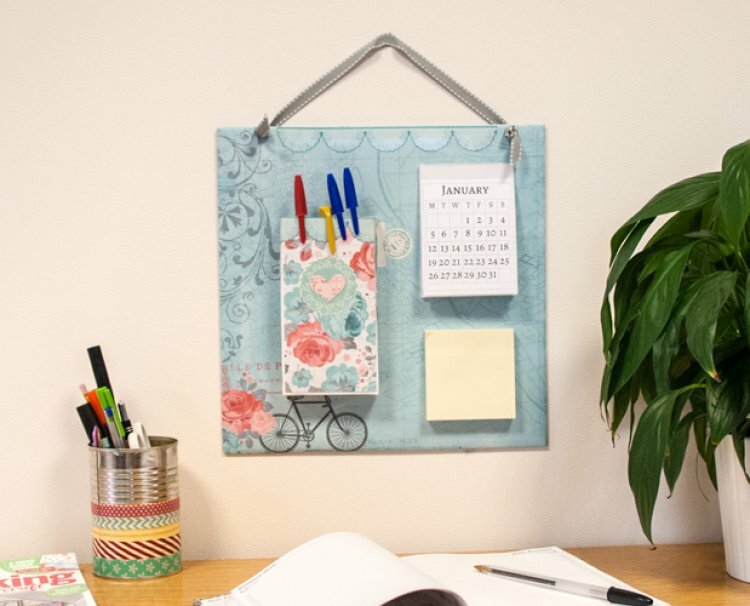 Arrange the calendar, post it notes and pen holder on the noticeboard, when happy with the layout, glue down. 5.Punch two holes in the top of the calendar and thread with ribbon to hang. 6.Decorate the noticeboard with stickers from the Parisian chic paper kit, then your noticeboard is ready to use. We love crafty makes that are useful too, once downloaded you can use your calendar template on a variety of different projects. Upload your projects using the free 2015 calendar template to our project gallery so we can see your makes.